When I hopped in the car at 6:30am to begin the trek North from Portland, OR to Longview, WA, I had no idea what to expect from the day. I knew I was going to help fish biologists at Abernathy Fish Technology Center with a stream sampling project but, aside from looking at pictures and reading project reports, I had no first-hand understanding of what “stream sampling” meant, or how sore I would be by the end of the day. One might wonder how it’s possible for a person who works for U.S. 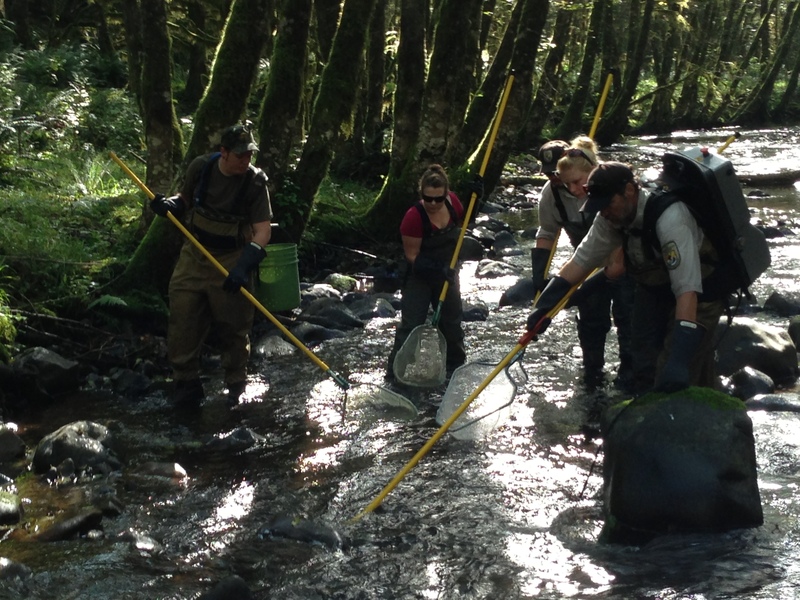 Fish and Wildlife to have no first-hand experience with stream sampling. The explanation is simple, really. I am a student at Portland State University pursuing a master’s degree in communication. Although I don’t have a background in aquaculture or fish biology, I am lucky enough to have a one year graduate assistantship with Fishery Resources to help with communication and outreach initiatives. As part of the communication work I do, I read about the scientific findings produced by field work, discover interesting facts about aquatic species and ecosystems I’ve never even thought to be curious about, and learn about conservation. While the content of the reading and writing that fills my days is interesting, most of my “field” experience takes place at a desk in front of a computer screen. All this to say, before the big day I had read plenty about the outcomes of stream sampling, but never had an opportunity to take the plunge. I was excited to escape my cubicle and experience a day in the life of a fish biologist! 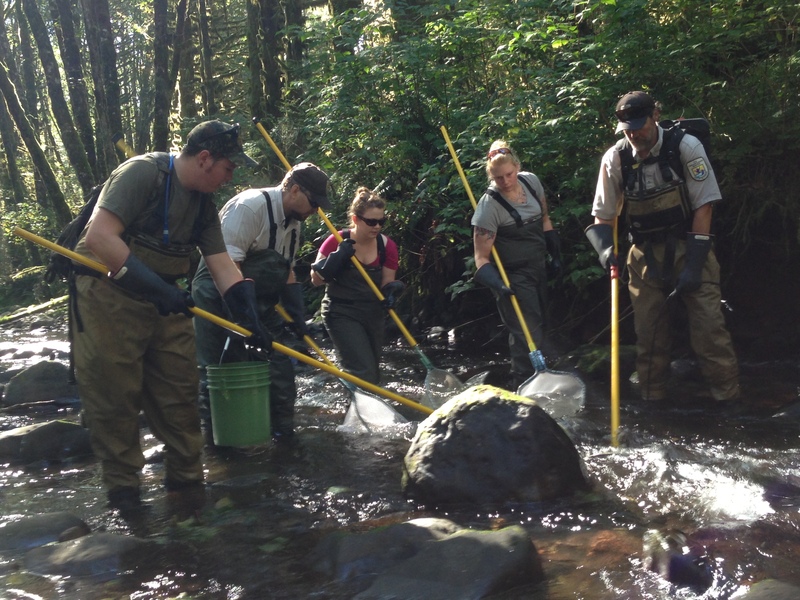 By reading past reports from this nearly 15-year-long project, I knew that the goal for the day was to collect juvenile coastal cutthroat trout and steelhead and to count coho salmon. The fish were being collected as part of a study examining the natural reproductive success of both hatchery and wild fish. 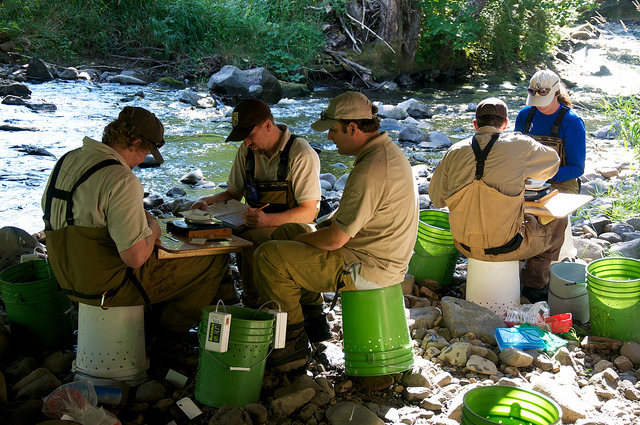 By trapping fish that are migrating upstream and collecting genetic information, biologists at the Technology Center are able compile and compare data from multiple years to map lineage and determine how hatchery and wild fish populations interact with one another in Abernathy Creek. I hesitantly waded into the creek. It had been a long time since I had been in a creek and I had never hazarded such an adventure fully clothed! 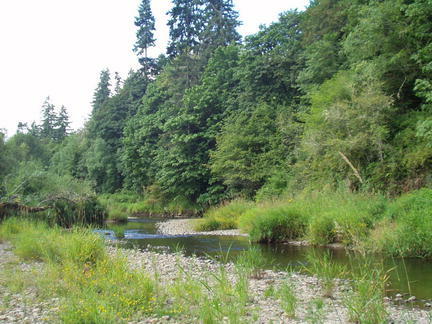 All my previous wading experience involved a bathing suit and water socks, and all my fishing experience had involved casting with my Snoopy fishing pole from a convenient position on a bank, dock, or bridge. One thing I knew for sure: I did NOT want to endure a ninety minute car ride back to Portland soaking wet. After a few tentative first steps, my apprehension was gone (Note: If you have never used waders, you should. They are…AMAZING!). Even though the icy water was up to my knees and about to get deeper, the waders kept me warm and dry. I was ready to go! Then reality hit. Walking upstream is not as easy as I thought it would be. Stumbling over rocks, fighting current, trying to keep track of my very long-handled dip net so as to not jab one of my fellow anglers—there was a lot to keep track of, not to mention trying to net fish! This wasn’t going to be as easy as I thought. So I stumbled along, net in water, following my mentors’ tips and hints as best I could. We slowly made our way upstream netting fish, collecting cutthroat trout and steelhead in buckets, and counting coho salmon. Ben Kennedy, the project lead who has been working on the study since 1999, mapped out four legs of sampling for the day. When we finished a leg, we continued on to the next while one of us carried the buckets of fish to the sampling team. 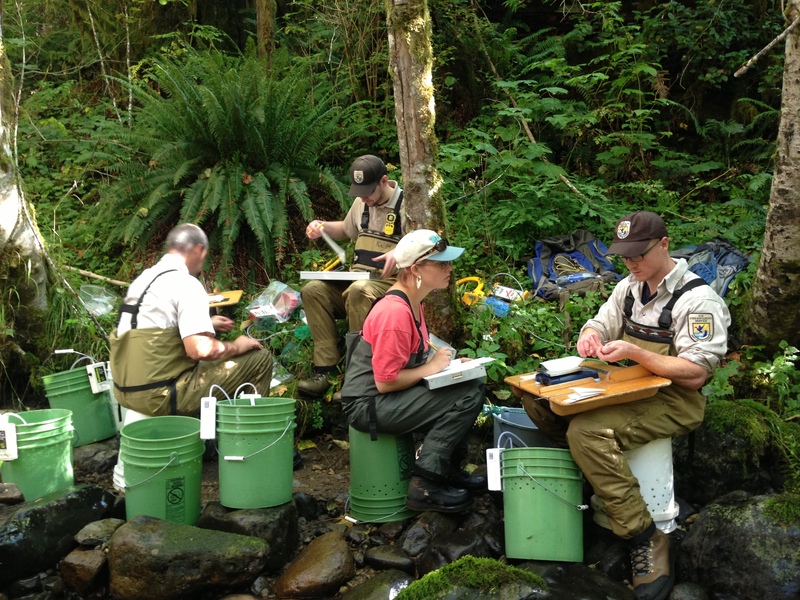 The sampling team set up a makeshift laboratory on the bank further upstream where they measured, weighed, and took steelhead and cutthroat trout scale and fin samples for genetic research. The crew also inserted tiny PIT tags (about the size of a grain of rice) into the steelhead to monitor their migration. After the fish were sampled and tagged, we released them into a shaded, deep pool with very little current in the same section of the creek where they were originally caught. By the end of the day, my head was reeling with new information and my body was sure to ache in the morning. It was a fun adventure to leave my cubicle and play fish biologist for a day. With one day of stream sampling under my belt, I certainly can’t claim to be an expert, but at least I’m not such a wide-eyed novice. 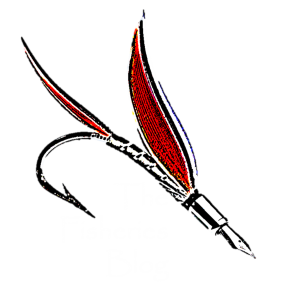 Check out these links to follow us on Facebook or Twitter (@FisheriesBlog), or enter your email in the top left corner of the page to receive period email updates. Sarah Martin, this week’s guest author, is a Graduate Assistant at Portland State University, where she is completing a Master’s Degree in Communications. Sarah has spent the past year working part-time in the U.S. Fish and Wildlife Service’s Pacific Region Division of Fishery Resources in Portland, Oregon, where she sometimes gets to wear waders. It sure was fun! How I wish I could experience being a fish biologist even for a day. I love fishing and your blog has challenged me to further my step in fishing. I have a nearly identical background to Sarah, but I would like to transition from communications to fisheries. Is there a person to contact, or a resource for me to learn more about how to make the career change?